...using the (amazing) boardlady website as my reference. Paint lightly with good quality preferable white 2K primer and sand most of it off. Paint ads insane amount of weight. Is he suggesting primer only, with no paint over it? The boardlady's paint page has some great instructions on how to mix, color match, and apply paint, but nothing I could see on what kind of paint to use. - I just want white, don't need precise color match. - I want it to look decent, but more important is good durability and weather/water resiliency. - I'm not as weight-conscious as I think Mike is, with his performance race board focus. - I also have some acrylic dust to re-apply non-skid if needed. - I plan to put bigger deck pads on with more coverage than the minimalist racing Padz that were on this board before. - Any suggestions for what kind of paint to use? - Should I skip paint altogether in the areas under my new deck pads, or is that a bad idea? 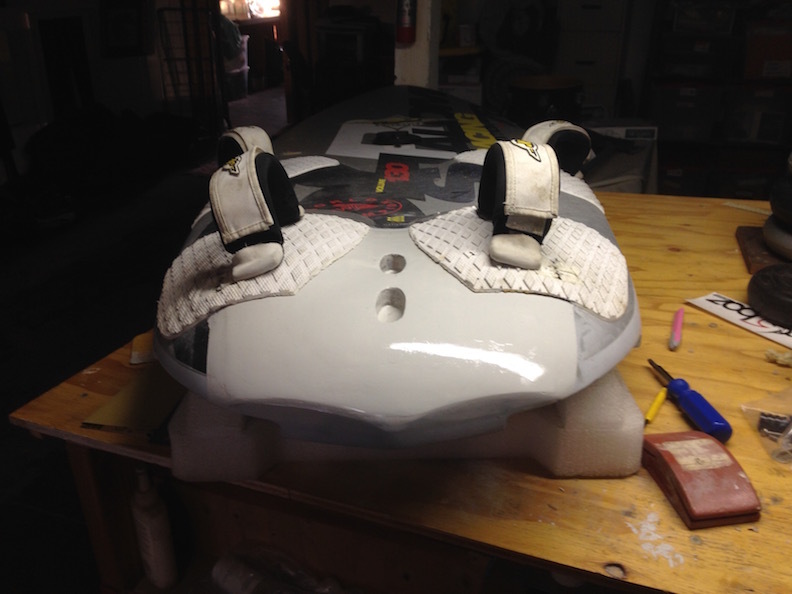 - Should I sand down to bare fiberglass ('er, carbon fiber) where we'll be re-applying paint? - Is it worth considering sanding the entire deck down to re-paint the whole thing? - Also, any advise for removing the contact cement residue where I removed the enormous nose pad? The contact cement residue doesn't seem to respond well to mechanical attempts at removal. Would sure appreciate any thoughts. Use an Epoxy spray can. Cheap and works perfectly fine. I once repainted a whole board with it! (see below). For my Foil conversion project I used a left over gray can. No need to prime. I would sand lightly, just get to a smooth surface ... you know that but be careful not to sand through the carbon! If you want to paint it white it seems just a lot of extra work for little return? If you do you will need to apply a new grip. More work ... thin layer of epoxy followed by the acrylic dust. 2k is a special primer. I would then apply a light coat of the best Home Depot or insert store, spray can of a spray bomb. Then sand again, prob use satin or flat. Do not use auto lacquer . I can detail if you pm me. Not an expert IMO. BUT LOADS OF EXPERIENCE. Check out NSI for the pads. I have a dog with OCD. Your project reminds me of him. I gotta ask ... did Mike agree that your straps needed moving, or do you just want to detune the high-performance racing board he designed so meticulously? OTOH, it's moot now, isn't it? A project so involved really makes me appreciate having board factories nearby. "Hey, Art, fix this." BTW, I install new pads right over the old ones if I use those locations. It adds lots of cush. If in a place I have no use for, I might spend about 5 minutes yanking off the old ones, slap the new ones over the residue, and never even know the residue is under there. Thanks for the quick responses and suggestions! Already done. Purchased the pad material from them months ago (back when I thought I was going to just hand this project off to somebody else). Just need to cut it to shape and glue it down after the board is painted. did Mike agree that your straps needed moving, or do you just want to detune the high-performance racing board he designed so meticulously? 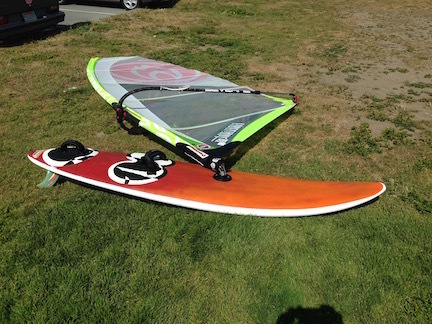 Mike designed the board for Formula windsurfing, and his footstraps are placed perfectly for that. I concluded long ago that Formula is way too much work for me. I'm re-purposing the board for foiling, and footstraps want to be in a very different place for that. Yeah, rub it in. Wish I had that kind of resource nearby. 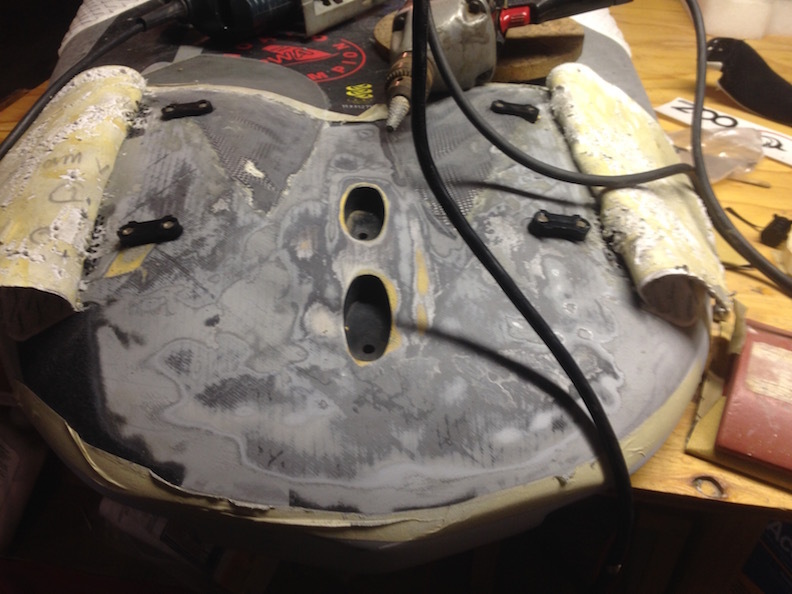 BTW, when I asked about removing the contact-cement residue, I was talking about in the nose area. I'm thinking I may not re-install the enormous nose-pad I had on there for learning to foil, and so want to remove the contact cement residue in the nose area before painting. I've been happy with krylon fusion paint, didn't use primer. I did get the can nice and warm then shot thin coats. It's an enamel but pretty tough. Very nice photographic survey of what you've done, and looks like you've done a high quality job. Regarding painting, you might want to investigate Eastman 2K paint in a can. The only problem seems to be that the color white doesn't seem to be offered. You can get primer gray, black, red, blue, orange and clear. Seems to me that you could do a partial colored top coat design along the lines that dvCali used and still retain the original white along the rails and preserve Mike's sticker and colored accents. Lastly, to paint your nose repair on the rail you could simply use a normal Krylon appliance white spray paint. Mike suggested using it for repairs back in the early 90s, and I have used it on many of his boards over the years since then. I've found that it matches pretty well. I'm looking forward to seeing how the job comes out. Best possible suggestion? Get a foil specific board. 1+ for Automotive spray can primer and paint from pepboys.